A Scary Time (Hailey’s Story)-Part 1 | I am JuJu! As I started outlining the story of Skylar’s diagnosis, I realized that there was a significant delay in progressing with testing due to many issues that we had with Hailey. Because of this and the fact that both girls’ medical issues impacted decisions we made for the future, I realized I should definitely share Hailey’s story. 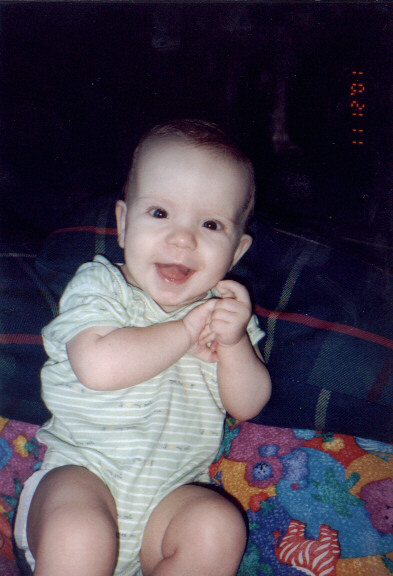 Hailey was born in April 2001 a healthy 7lbs 11oz. My pregnancy was uneventful and I had a pretty easy delivery (well, as “easy” as childbirth can be). Besides being jaundiced for the first week, Hailey was completely healthy. Hailey took to nursing right away and was adamant about not taking a bottle. This was definitely my 1st indication of how strong-willed Hailey was. About a month after she was born she started showing signs of colic. She would cry every evening between the hours of 4:oopm and 7:00pm without fail. This continued for 3 months and just when we thought we might pull our hair out, it stopped. 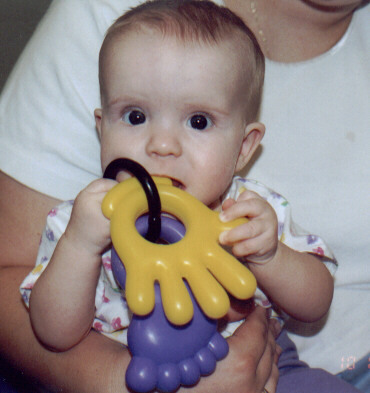 Hailey continued to grow and gain weight although she was frequently ill with ear and sinus infections. As she continued to reach each milestone, we weren’t overly worried about the recurrent infections and kept thinking and praying that she would grow out of those. At this point, we had noticed that Skylar, who was not quite 3, had stopped talking quite a bit. She was definitely well behind her cousin Becca who was 6 months older. I was trying not to compare as at this age; 6 months difference is really quite a lot. I remember chatting with my sister, Jenny and mentioning that Skylar wasn’t doing many of the things that Becca could do. At her next doctor’s appointment I mentioned to the pediatrician my concerns and he assured me that she “looked fine” and that all kids develop at different rates. 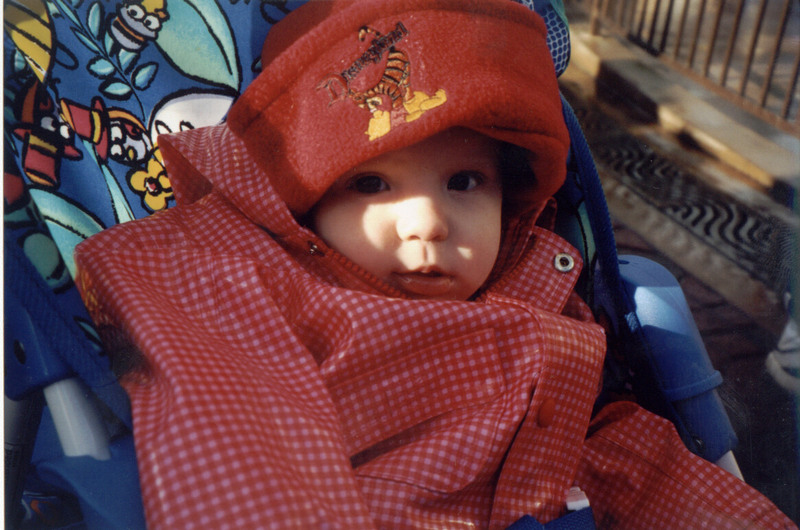 In February of 2002, Hailey went in for her well-baby check. We had to reschedule her appointment several times as she was never well enough to get her scheduled vaccinations. At this point, she was still nursing as well as eating solid foods, but I noticed that she had stopped gaining weight. She was still wearing 6 month old sleepers and she was almost 10 months old. She was also not fully crawling yet. She would “scoot” around a bit. Her appointment went fine, the doctor said that she looked healthy and happy. Again he told me that all kids reach milestones at different times and that there was nothing to worry about. She received multiple vaccinations that day and as always, I pre-medicated her prior to receiving the vaccines as both my girls always spiked a fever afterwards. As we sat down with the nutrionist, I pulled out my notebook with the calories that I had tracked for Hailey for the previous 48 hours. The first day was 113 calories and the second day was a mere 65 calories. Sadly, I had worked so hard for those calories. Putting butter on her ritz crackers and constantly trying to get her to eat anything and everything I could. Clearly, my numbers showed how little I could get her to actually consume. When I looked up from my notebook, the nutritionist said “I really want to go over the food pyramid with you so that you know what Hailey needs to be eating in order to grow”. Immediately I got that “warm” feeling. I could tell that my face was getting redder by the second and my heart rate was through the roof. I interrupted her immediately and assured her I did not need her food pyramid talk. I explained the situation and told her that I was sorry if the doctor gave her the idea that I didn’t know what to feed my daughter, but that we did NOT need her services. I told her that I didn’t need someone to tell me how to get extra calories into my child, but that I needed someone to tell me WHY my child had completely stopped eating. With that, we walked out of the nutritionist’s office with no answers and feeling worse than when we walked in there. On the drive home I mentioned to Chris that I had still not heard anything about the results from Hailey’s bloodwork. He decided to run into the lab and ask them for a copy of her results. When Chris brought them out to me, I immediately noticed that several of her readings were off and that she definitely needed further blood work done. I put in a call to the clinic and received a call back from the nurse a couple of hours later. She said “Dr. M says that your daughter’s labs are completely normal and that you have nothing to worry about.” At this point, I knew that we needed help and we needed it fast! The four of us were scheduled to leave in a few days to northern Virginia to visit my mom & dad for Spring Break. My sister and her family would be flying in the day after for vacation as well. I called my dad and told him that I wasn’t sure if we should be traveling with Hailey as she was still not feeling well and hadn’t eaten much all week. I’ll never forget his response. “Julie, you get on that plane and get yourselves here. We are going to get you the help you need!” For the first time in a couple of weeks, I felt that everything was going to be alright. We arrived in Virginia about 48 hours later and as my dad took Hailey from me at the airport he immediately commented on how small she was. My mom was working for 2 internal medicine doctors at the time and she told us that the female doctor in the practice, Dr. Beth, had agreed to come over to the house the following morning to check Hailey out and give us her thoughts. The following morning as Dr. Beth walked into the house she said “Julie, your mom has filled me in on your situation a little bit and I’m going to do a quick physical on Hailey. I just want to tell you though that some babies are just small and that there might not be anything to worry about”. I told her that I was just thankful that she came over to give us a 2nd opinion. As I took Hailey’s pj’s off the doctor’s smile immediately changed to a look of alarm. She quietly went about doing her assessment and then said “Ok….this clearly goes beyond just being a small child. Hailey looks like a head attached to a skeleton. She is extremely thin and has very little strength. I’m going to step into the kitchen and make some calls and see who I can get her in with”. As she walked into the kitchen I immediately started crying. I was not only crying because I was worried about Hailey, but as crazy as it sounds, I was also relieved. I had been telling her doctor for weeks that something wasn’t right with Hailey and he kept telling me she was fine. He had made me feel as though I was losing my mind. To finally receive some confirmation that something wasn’t right and that I wasn’t crazy was such a relief. After a few minutes in the kitchen, Dr. Beth came out and told us that we had an appointment with a pediatrict GI specialist in about 2 hours. I knew that we were dealing with something pretty serious as it normally takes months to get in to see this kind of specialist. She told us that we needed to call the clinic as they needed our insurance information to get authorization for our visit. I was worried how this was going to go as Tricare had a really wonky system at the time. We lived across the country and I knew that we would have to have a referral from Hailey’s doctor, Dr. M, in order to be seen “out of our network of providers”. This was going to be tricky. Chris called the base clinic back in Tucson and left a message for Dr. M that we needed for him to put in a referall for Hailey to see this specialist. Almost immediately we received a call back from the nurse with a message from Dr. M. He was refusing to put in the referall “as there is NOTHING wrong with your daughter”. I went from frustrated to FIGHTING MAD. I knew that I needed my dad’s help at this point. As we got into the car to head over to our appointment we were so worried that we would miss this opportunity to see this specialist because of the referall. You can imagine our relief when we walked into the doctor’s office and the secretary said “Hi Mrs. Coryell. Dr. Lee is ready for you now and we just received authorization from Tricare for your visit today.” I’m pretty sure that you could hear an audible sigh of relief from all of us. Thanks for taking the time to listen to Hailey’s story! Thank you for sharing! I never knew all of Hailey’s story. I miss you all!!!!! Pingback: A Scary Time (Hailey’s Story)Part 2 « I am JuJu!